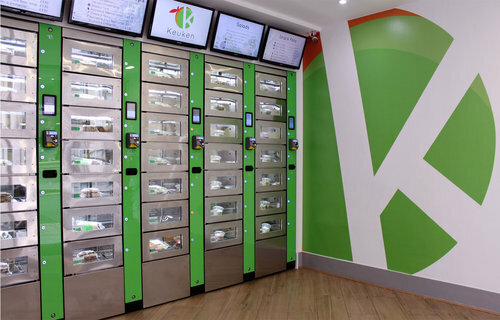 The Automated vending restaurant in London is a hit! Want to grab your lunch without having to make small talk? That could all be a thing of the past soon thanks to Keuken, London’s new vending machine restaurant. But it isn’t just cans of Coke and packets of chips on the menu – they’re preparing salads, sandwiches and wraps in the kitchen before loading up the vending machines with the goods. The restaurant will be a cash-free zone, so you’ll make your selection, pay on card and hopefully be in and out within a few minutes. Their cashless, self-serve pods are designed them for busy people who want to eat tasty, nutritious food. Each of the pods are refrigerated, ensuring complete freshness. Automated Vending Restaurant, Autoretail, Automated Retailing, has never been so convenient. The system is catered for office workers and commuters who don’t want to waste time waiting in line. No cash accepted. Instead it accepts all debit / credit cards and payments like Apple Pay. The restaurant’s founder said that selling the products through vending machines means they have more money to invest in the food, which means better quality and bigger portions. Less small talk and more food? Sounds like something we can get on board with. 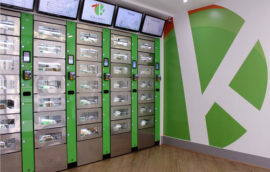 So the next time you’re in London and want to get a slice of technology (and the pie, too, which we hear is pretty good), visit the Automated Vending Restaurant, Autoretail, Automated Retailing, retail establishment – Keuken! 2014 | ALPS Innovations Group Inc.